We are from the government and are here to help. Endlessly. The deadly ambush in Niger last October that left four U.S. serviceman dead prompted months of hand-wringing inside the Pentagon. But that botched operation, which drew national attention to U.S. counterterror operations throughout Africa should not have shocked military leadership, the former commander of U.S. Special Operations forces in Africa told VICE News. In 2017, U.S. troops carried out an average of nearly 10 missions per day —3,500 exercises, programs, and engagements for the year — across the African continent, according to Gen. Thomas Waldhauser, the AFRICOM commander. These efforts — carried out in at least 33 countries — range from capture-or-kill commando raids to more banal training missions. Americans are also gathering intelligence, involved in surveillance and reconnaissance missions carried out by drones, engaged in construction projects, and accompanying allies on tactical operations. There are also now 34 U.S. military outposts on the continent, concentrated in the north and west and the Horn of Africa, according to a recent report by The Intercept. 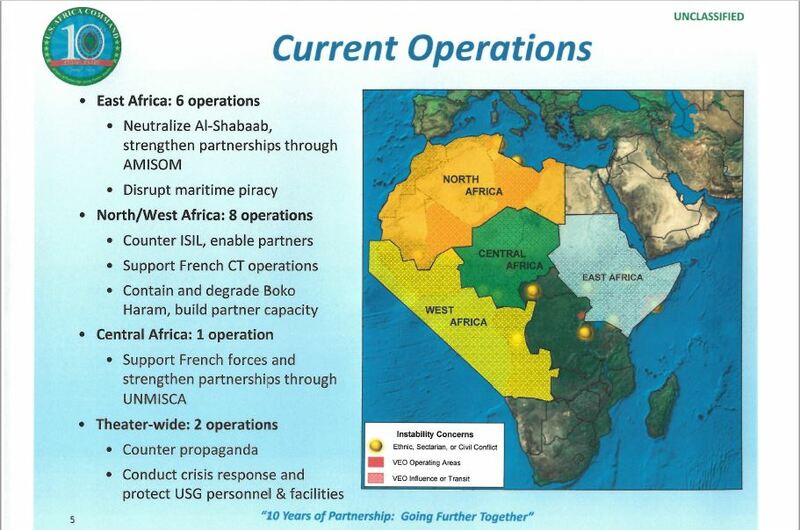 This March 2018 briefing authored by Africa Command Science Advisor Peter Teil outlines current U.S. military operations throughout the African continent. (Nick Turse for VICE News). This entry was posted on December 17, 2018 at 8:52 am	and is filed under Uncategorized. Tagged: Africa, Juniper Shield, military operations, Obsidian Nomad, SOCAFRICA. You can follow any responses to this entry through the RSS 2.0 feed. You can leave a response, or trackback from your own site.